are harrowing and melancholic—some may even refuse the experience while others will be inveigled by proximity. Torah from a Rebbe is demoted to unpublished or hidden archives, new compilations, exercises in synthesis and newly organised anthologies of existing material. Those seeking essential counsel resort to second and third-best options, including the somewhat questionable practice of randomly opening volumes of old letters in order to seek the elusive advice to a new problem. On several occasions, the Rav, a scion of Brisk, also gave testament to the importance of retaining an important Rabbinic figure as one’s guide, in keeping with the dictum of עשה לך רב. This phenomena is, of course, not new. Poignantly, the Rav added that even after the פטירה of one’s רב המובהק, it is paramount to attempt to envision what the רב המובהק might have advised. The Rav evinced the loneliness he succumbed to when his own guide(s) had passed on to another world. 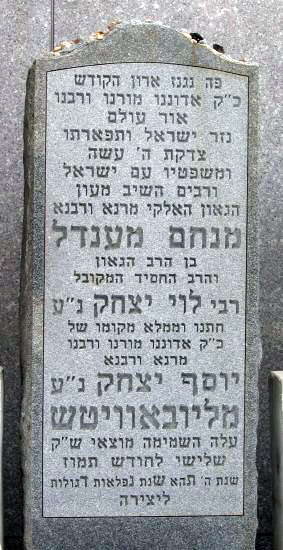 One of those apart from his father, was undoubtedly, the Gaon Rav Chaim Heller ז’ל. See this 2007 link from Mississippi Fred McDowell’s great blog for more about Rav Heller. Both the Lubavitcher Rebbe and the Rav used to meet regularly at the home of Rav Chaim Heller in Berlin, but I digress. Accept that the נפטר has passed onto another world and aspire to meet again with the advent of תחיית המתים, the resurrection of the dead. Amongst Hasidim, the two groups who have not replaced their Rebbe and continue to flourish are Breslav and Lubavitch. Breslav is not a new phenomenon. Habad Lubavitch is comparatively new and its overt asssertion that the late and last Rebbe was the Mashiach to be, attracted much controversy. We are led to believe that Habad is split between those who believe he is [still] Mashiach and those who do not. How many are in each camp? I feel that most Habadniks actively conceal their views. Why? Why do they not display the courage of their convictions? Why would they be ashamed to state their opinion on such a matter? Is it because they are not sure, or is it because they do not want this to be a known opinion because it may turn others off? People who accept approach 1, above, constitute a group that I do not even begin to comprehend. Some would suggest that this group would benefit from psychiatric therapy. Let’s put them to one side. Approach 2, in my estimation, encapsulates some 95% of Habadniks whilst the remaining 5% associate with approach 3. These are just my feelings. They are not supported by statistics. They cannot be supported by statistics given that Hasidim are reluctant to state their views unambiguously and on the record. The Rebbe will come back as the Moshiach and it is impossible for anyone else to be Moshiach since the Rebbe is the Nosi HaDor and the Dor HaShvii (I don’t know the definition of Dor, but no matter). The Rebbe may come back as Moshiach. He is also likely to, but it is not certain. הקב’ה may decide that Moshiach is someone other than the last Rebbe. The Rebbe is not Moshiach, but he will greet Moshiach, resurrected, together with other great figures of Judaism. Let’s consider the difficulty in eliciting clear statements of conviction by looking at my own stomping ground, the Yeshivah Center in Melbourne. Where does the Yeshivah Center stand? It is a matter of interpretation. In my opinion, most in the Center do not have the courage to express their convictions publically. Instead, they camouflage behind the bold יחי sign hanging at the back of the main shule and allow this to passively stand testament to their views. Why should this be an issue captured by a sign? It has always been policy to never disenfranchise people by having the courage of one’s convictions to state one’s views on non halachic matters where those views may not be accepted. There are things that are only said in whispered tones amongst אנשי שלומינו (i.e. card carrying Hasidei Habad) and things which are concealed from עמך—the rest of us. Have a close look next time you get a wedding invitation with these words on them. Do they appear in the English text as well? Why not? The boys’ school casts a blind eye to the daily chanting of יחי, three time after the obligatory היום יום. This chanting would seem to me to be diametrically opposed to the psak of Rabbi Groner ז’ל. Transparent games are being played when it is claimed that “it’s not the main shule” or it’s “not an “official” minyan of the school“. Of course, both of these propositions are just fallacious deflections. The boys’ school has a יחי sign in the Mesivta room proper. Did Rabbi Groner allow two signs? When? I heard his psak with my own ears. At Chabad Youth Camps, יחי is chanted not once but three times a day, after שחרית מנחה and מעריב. When asked about this, the response is that “it’s not official policy“. Sure thing! Can we expect spontaneous tolerance for the singing of התקוה three times a day as well? On a Friday night, when the Rosh Yeshivah of Yeshivah Gedola is not in attendance the בחורים, sing יחי. When he is there, they won’t. Does the Rosh Yeshivah not know what goes on? Is there an innate tension in the air? New reprints of older publications fail to remove שליט’א even when it’s obvious it’s not a simple reprint of a שיחה. Indeed, one recent publication for י שבט listed the period of each Rebbe’s “reign” or נשיאות. 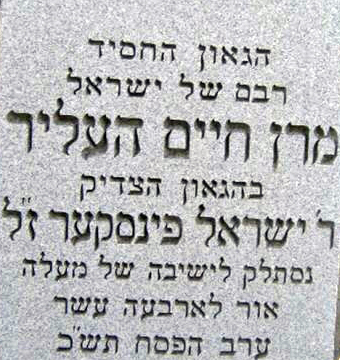 Unsurprisingly, the last Rebbe did not have an end date nor was the ubiquitous שליט’א elided. How many parents put יחי yarmulkas on their children, but don’t have the fortitude to wear them themselves. I’m not one of those, like Professor David Berger, who allegedly contends that the יחי chanters are idolators or apikorsim and Chabad should be marginalised as a result. I’ve read Rabbi Berger’s book and I don’t find many of the arguments compelling. The chanting of יחי does bother me—it bothers me to a great extent. I know, though, there is nothing I can do about it except present my views. I know those views are largely ignored and inconsequential. What I have difficulty with, though, is the pretence. Let’s call a spade a spade. The Yeshivah should come out openly and either say they support the saying of יחי as per nuance 1, or outlaw it across the organisation. If they wanted to outlaw it, they could. They hold the purse strings and salaries of many in the organisation. Have the courage of your convictions. Pull out those yellow flags and wave them with gay abandon? Isaac, I really enjoy your blog. Though I must say that it is because of blogs that mention mishechistim and the comments that usually follow is the reason why people choose to hide their opinions. There are people that are tolerant of the idea that someone can believe in their Rebbe in such a powerful way to the extent that the Gemara says in sanhedrin (98b) that when discusing who Moshiach is, the Rabbi’s all said a name and that was that of their Rebbe. But there are much more that have no tolerance what so ever, or at least are much more outspoken. What ends up happening is that people choose not to say their opinion and not to explain it because they would be calling on deaf ears. So instead of being ostracized by half of the frum world, they chose not to discuss the topic entirely. Another reason might be, that it is something that is of no importance and does not define what or who a chassid is. The latter is was most normal Lubavitchers hold. What the belief is is not important, the way you address it is. I once commented before that there is a hergesh and halacha. Someones belief in the Rebbe zy”a being Moshiach can not go beyond the point of hergesh and that means it is irrelivent to anyone else what someones hergesh is. Once he says that it is Halacha and nothing can change that, the person is going way too far. On the other hand, my opinion is what the Alter Rebbe said when asked if Moshiach will be a Chossid or a Misnagid. He answered that it will no doubt be a Misnagid. If it will be a Chossid than the Misnagdim won’t except him. What the Alter Rebbe was saying is that it should not be relevant who Moshiach is or will be. A Chossid means; to be a religious Jew and follow the directives of the Rebbe. That’s all. Who is Moshiach? I don’t, nor do I care, as long as he comes soon. Mendy, I appreciate your comments. Certainly this blog won’t allow unfettered comments that are disrespectful. If I am to accept what you say, then it means that if nobody had objected to meshichism then people wouldn’t go underground with their views. Of all groups that couldn’t give a “Feyf” if others disapproved of their beliefs or הנהגות then I’d say Chabad were easily the bravest. Consider a more halachic issue which created and still creates a tumult: that of not sleeping in a Succah. If we are to follow your logic, would you then consider that Chabadniks would hide the fact that they don’t sleep in a Succah? There are other positions that some Meshichists may hold (e.g., gilgulim) but it’s certainly frustrating that there’s so much noise about Yechi and so little about what they actually believe. It’s a tragedy that a movement which prided itself on intellect and restraint has been utterly degraded by a know-nothing movement of impetuous bochrim and second-rate mashgichim. But perhaps this in itself is a sign of an approaching redemption. 4. Recognize that the niftar has fulfilled his tafkid and understand that he has taught you to fulfill yours, not by saying what would he have done, but by knowing how he would want me to analyze and act. Isaac, you bring up a very good point. Seemingly Chabadniks should hide the fact that they don’t sleep in a Succah. But not sleeping in a Succah is a clear directive of the Rebbe zy”athat he spoke about and expounded upon. On the other hand who Moshiach is, is something that people like to make “diyukim” on Sichos or Rambams or Agada in the Gemorah. So you are right, if you have a conviction for something you will speak up. But if it is more a personal feeling, than not necessarily. My take is that all Lubavitchers are Meshichistim. The only difference is that some admit it, while others don’t. I have never heard a Lubavitcher say, “There is no question in my mind and heart that Rabbi Schneerson could definitely NOT have been (potentially) the Moshiach”. All this business is actually quite absurd to me since the Torah is explicitly G-d – oriented and not Moshiach-oriented. Our thoughts, prayers, aspirations, wisdom, etc. are all about G-d. The Almighty Creator. The One and Only, only Him with no Shituf, Chas V’Choliloh. This extreme focus on “the Rebbe” and Moshichus is totally deviant and unJewish and is a total Psul in their ideology and theology and must be fought and eradicated. To Reuven Brauner: You recently posted two comments, both regarding Lubavitchers and your lack of understanding in them. I first must say that the questions you raise are not new ones and had you been looking for answers you would have found them. In fact they are not rational questions at all, but rather emotional ramblings. An emotional question can not be answered with intellectual responses. However, I will give you the benefit of the doubt and respond. 1)”My take is that all Lubavitchers are Meshichistim”. I don’t even know if this requires response. The fact that YOU think that all Lubavitchers are Mishichistim is supposed to mean something? And who pray tell are YOU to have an opinion on all Lubavitchers? The reason for this, is because no one can say that there is no question in anyones mind about someone that he is or isn’t Moshiach. After his life I will not get into, but DURING, is there something so terribly wrong (C.F. Sanhedrin 98b)? 3) “Torah is explicitly G-d oriented”. No one is disagreeing with that. It so happens to be that if you open and learn a sefer of Chabad Chassidus you will understand what the hype about G-d is and what the hype abou Moshiach is. Yes, everything is to Hashem and we implore of Him at least SIX time during each Shemoneh Esrei to send the Moshiach. 4)”The extreme focus…” If your issue is the focus on the Rebbe, that you can not understand, I feel bad for you, all it takes is to open up to the second chapter in Tanya to understand. If you issue is the focus that the Rebbe is Moshiach, I can not answer that because I myself do not understand it. S.F. Comment 1. Regarding your comment in “Michtav Bracha”, I have never seen someone misconstrue an idea so badly before. It would take much more than a simple comment to put you on track. It is appalling to see that you can not tolerate that there are people that attribute things to their teachers and leaders that you do not to your own. The fact that we have a different understanding in Tzadik; that makes you so “turned off”? Lastly, you say the Idea of compelling an audience to stand is absurd? No one is compelling anyone anything. You go to some else’s simcha, where they have a minhag to stand for the recitation of the Rebbe’s Letter and you think it is absurd to request that people have respect for this minhag and comply? This attitude comes from great sinaas chinam – intolerance. I have great pity on you and anyone that you might bring up in the same manner. I have never heard a Lubavitcher say, “There is no question in my mind and heart that Rabbi Schneerson could definitely NOT have been (potentially) the Moshiach”. And you never will. Why on earth should they say such a thing? Do you define anyone who will not make such a statement as a “meshichist”?! I define anyone who will readily make it as a suspect for apikorsus; I have grave doubts whether such a person really believes in a moshiach at all. I think any honest Jew must admit that the Rebbe could have been the moshiach, and the fact that (it appears that) he turned out not to be doesn’t detract from that. 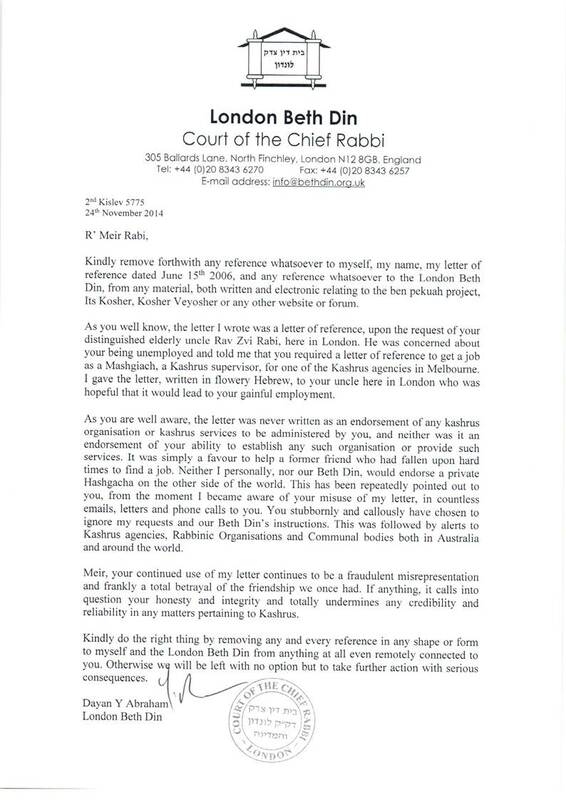 Previous Previous post: What did R’ Chaim Brisker really tell his grandson the Rav?